Kim has appeared in several of HPCP’s annual Halloween show, An Evening of Horror and Suspense, as well as in An Ideal Husband and several staged readings, most recently as Lady Bracknell in The Importance of Being Earnest. It’s so great to see you! 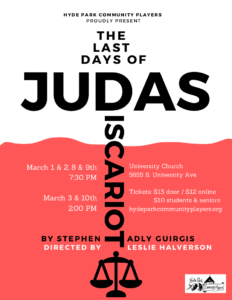 It’s been a while, what made you want to audition for The Last Days of Judas Iscariot? It’s been some years since I’ve done a main stage show, it just felt like time to try again. I saw the announcement about auditions, and the title sounded like a very serious drama. But I talked to some Players and I learned that there was some comedy, which I prefer. It’s a very interesting take on something we all know about. You are playing St. Monica, a character who Gets Things Done. Have you connected with her? I think I do, she’s a city girl, very level headed. She’s very proud of herself and son. She’s connected to her roots. I’m so nervous. Maybe I’ll forget the lines, that people are going to laugh [which they will]. I don’t know when they will laugh, so I have to focus. Susan behind the judge’s bench is terrifying. I love all the little mannerisms you use to make this character different than anyone I’ve seen you play before. 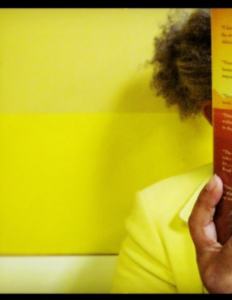 Your monologue is delivered to a character who is basically comatose, how challenging is that? Oh thank you. It’s basically talking to myself, talking to the audience. I secretly kind of want to break Ryan, to get a tiny smile from him. I’ve loved all the roles I’ve had. I’m glad to be here!